You Are Here: Home » Are you missing the #1 accessibility guideline? Do you use images in your blog posts? Does writing alternate text or where to place it baffle you? The Blogger’s Ultimate Guide to Making Images Accessible: How to Use Alt Text Effectively in WordPress is for you! 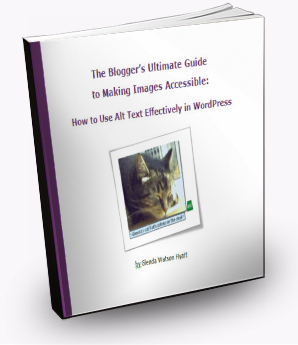 The #1 way to improve accessibility of blogs is to provide alternate text for images. Yet, bloggers from newbies to A-Listers constantly and consistently miss this step when writing posts. They don’t know what makes images inaccessible or what the solution is. How to write alt text or where it goes escapes them. And, if the image is complex, forget it! When, in fact, adding most alt text takes less than a minute and benefits their blog readers with low vision and those who are blind, as well as search engine optimization. Effectively using alt text is something every blogger can do to improve accessibility for their blog community. How Do Images Cause an Accessibility Issue?